What Type Of Federal Prisoner Will You Be? What Type Of Prisoner Will You Be? Since releasing from prison, on August 17th, 2009, I have spoken to a number of businesses and Universities about ethics. Last Friday I addressed 4 additional classes at USC’s Marshall School of Business. 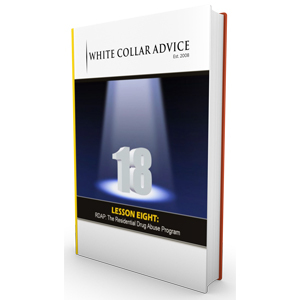 Last Monday the 5th and for the first time since my release, my lessons moved from preventable to advisory. I visited the courthouse in Downtown Los Angeles for the first time since February 25th, 2008, the day I was sentenced to an 18-month prison term. Fortunately, my return didn’t have the ominous feel most offenders come to associate with a federal courthouse. I visited the courthouse to help lead a class called “The Keys to Successful Incarceration”, geared for defendants and their families preparing for the next phase of the justice system: federal prison. Shortly before my sentence expired a pretrial services officer, who created the class, asked me to share my experience of navigating the prison system, while also fielding questions about the unknown world of confinement. I was flattered to have been invited, and knowing that I could help, eagerly accepted the invitation. 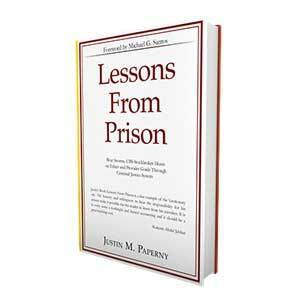 I donated 50 copies of Lessons From Prison with the hopes that everyone in attendance would be given a copy. Anyone who has read my blogs, or book, knows that I believe prisoners have a duty, an obligation to make good use of their time while incarcerated. In my case, I felt as if I had encroached upon my family long enough. They didn’t mind helping me, and I will forever be grateful for their emotional and financial support. I am practical, however, and I recognized that at some point I would need to sustain myself again, like I did from the day I graduated USC. With my family constantly in mind, I made the most of my time in prison. Rather than spending my days lamenting interminably over the injustice of my predicament, I decided to look inward and reevaluate the patterns of my life. I finally acknowledged that I alone was responsible for my troubles with the law. I accepted that retribution and punishment were part and parcel to the unethical and illegal choices I made while managing money at both Bear Stearns and later UBS. Only after I embraced these concepts could I find the strength to heal. The alternative would have been to cling to a negativity that holds back so many prisoners. During my presentation I offered the same advice I received from Michael Santos shortly after surrendering to Taft Federal Prison Camp. I urged the new prisoners to think more about what they will do once they leave prison. Starting with the end in mind helps ensure that the days are spent productively. Such thoughts will serve any prisoner far better than lamentations about the injustices of their confinement. One man I met described himself as an accountant who was wrongfully accused of taking kickbacks. The man went on and on about how he did not deserve to serve a single day in prison, about how he was the “fall guy”, and how he has suffered enough. Sounded like me 20 months ago, I told him. I am in no position to determine this man’s guilt or innocence, nor is it my primary mission to make a judgment on the justice system in America. It is what it is. The value I aim to provide, I reminded him, is to help my fellow prisoners make the most make of apparently strenuous situations. Like my new friend, I too, once assumed that a prison term would be a total waste. Yet a proactive adjustment yielded one of the most productive years of my life. That may sound strange to some, however, the truth is the truth. I left prison emotionally sound, intellectually prepared, spiritually balanced, and physically fit. Being emotionally sound, I’ve recently come to learn, has assisted me the most. Why? Being emotionally sound has shielded me from ducking into obscurity, like so many good men do after they leave prison. For the first time in my life, I refuse to engage in fantasies about how I wish the world would be. Rather, I accept and own that this is my life; still a pretty good one. I won’t run and hide from the shame of my conviction. Too many prisoners, most of whom do not embody wickedness and depravity are too drenched in pain and shame to come to terms with their predicament. The result? Their 18, 36, or 60 month prison sentence becomes a life sentence. I promised my family, and myself that I would strive to be different. I’m not there yet, but I am trying. I was asked during my presentation what I did best in prison. Simple, I told a young child who’s father is preparing to enter federal prison. I never gave up. Ever. I’m no different than any other federal prisoner, I reminded him: I wore the same Khakis and white-tees; I was counted 6 times a day; I waited in line at the same chow hall; I scrubbed the same pots and pans; mopped the same floors; and ran the same dirt track. But, I never forgot that some day my release would come, and I knew I would be faced with the same struggles millions of Americans deal with daily: mortgage, car, insurance, etc. I had to be ready. P.S. Learn more about our Blueprint Program here.